It's Monday and the start of a new week of chambray looks for my 30 day challenge. Today's outfit features my brown wide-legged pants that have carried me through a few summers and are begging for a new style spin and a breath of fall air. 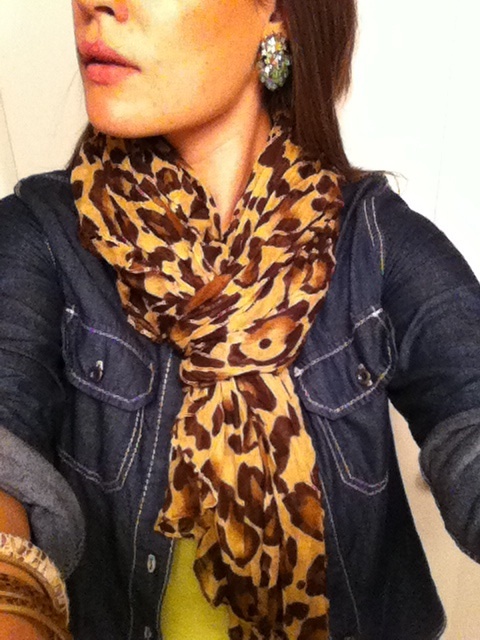 The dark chambray was the perfect hue to mingle with the dark brown of the pants and the leopard print of the scarf. Instead of keeping the look simple and stream-lined by way of wearing more neutral colors, I added a bright "tree frog green" tank top (you could call it lime, citron, or your favorite crayola crayon color in the green family). From there and because the scarf created/replaced a necklace, I added these vintage stunners whose stones played off the blues of the denim and the greens of the tank. To my wrist I added bangles with python dotted and giraffe fabrics. The mix of animal prints was unexpected and blended well with the scarf without being a direct match. Because animal prints can make a great neutral, I encourage you to experiment pairing them with color. Jewel-tones provide deep, rich, and sophisticated looks while brights make for playful, edgy, and vibrant looks.